Halicarnassus , (originally called Zephyria), an ancient city of Caria in Asia Minor, on the Ceramic gulf. Its site is now occupied by the town of Boodroom or Budrun, 96 m. S. of Smyrna (pop. about 10,000), one of the most miserable of Turkish towns, notable only for the remains of the ancient city. Halicarnassus was founded by a colony from Troezen, and was one of the six cities which constituted the Doric hexapolis. It was afterward excluded from that confederacy, and was conquered by the Persians under Darius, who permitted Lyg-damis, a Greek, to rule it under his authority, with the title of dynast. Under Lygdamis and his successors Halicarnassus retained its Grecian character and language, but remained faithful to Persia; and Artemisia, his daughter and successor, fought in the fleet of Xerxes at Salamis. About 380 B. C. the city appears as subject to independent Carian princes, the most famous of whom was Mausolus, husband and brother of the younger Artemisia, who restored and fortified it. He died in 352, and over his remains Artemisia caused to be raised a monument so beautiful that it still gives a name to similar structures. Not long afterward the city reverted to Persia by the marriage of one of its queens with a Persian satrap, and after a long siege it was taken by Alexander of Macedon, who destroyed most of it by fire. From this catastrophe it never wholly recovered. It afterward passed under the sway of the Ptolemies of Egypt, and still later of the Romans, who assigned it to the government of Rhodes after their victory over Anti-ochus the Great of Syria (190 B. C); it was afterward annexed to the province of Asia. On the downfall of the Roman empire it was laid in ruins, and after the knights of St. John had occupied Rhodes they built here about 1402 a castle called the "tower of St. Peter." At the final siege of the island by the Turks (1522) the knights caused this fortress to be repaired with stones taken from the ruins of the ancient city. The place was known at this time by the name of Mesy. Halicarnassus was the birthplace of the historians Herodotus and Dionysius. - The plan of the city was grand and symmetrical. From the edge of the harbor the buildings rose on terraces, formed partly by excavations from the rock and partly by walls of masonry. The first terrace was crowned by the Mausoleum, the second by the temple of Mars. Two citadels occupied volcanic hills at the upper end of the city, while the whole was enclosed by a wall which can still be traced. The palace of Mausolus and the temple of Venus and Mercury probably stood on the two points of the harbor, forming the extremities of the city. The fountain of Salmacis, a theatre of which the ruins are yet prominent, and various beautiful temples, were among the other attractive features of the city. The most celebrated monument was the Mausoleum, which ranked among the seven wonders of the world. It was built by Pytheus in conjunction with Satyrus, and the sculptures are ascribed to Scopas Bryaxis, Timotheus, and Leochares. The share of Timotheus, however, is assigned by some Greek writers to Praxiteles. It was still standing in the 12th century, but was overthrown either by an earthquake or by lightning before the building of the castle by the knights of St. John; and the detritus washed down from the hills, which filled the lower part of the city in some places to the depth of 20 ft., and concealed parts of the terraces, completely covered its site. In 1522 the knights, in removing some half-buried white marble, discovered a richly decorated and sculptured chamber, leading into a smaller apartment, where they found a sarcophagus and a beautiful vase, which they left untouched, but next morning they returned and found the tomb rilled. These chambers were undoubtedly the interior of the Mausoleum. The site of the ancient town was discovered in 1839 by Lieut. Brock, and in 1840 the English ambassador obtained permission to remove a number of slabs, which were deposited in the British museum. Most of them had suffered severely, the heads of the figures being nearly all wanting, but a few are magnificent specimens of art. All attempts to rediscover the Mausoleum proved futile, until in 1856 Mr. Newton, the British vice consul at Mitylene, undertook a more thorough search than had yet been made. Three ships were placed by government at his disposal, and most of the excavation was done by their crews. Several experiments were made in digging before the site of the Mausoleum was reached. On Jan. 1, 1857, Mr. Newton began digging at the foot of the highest terrace, on the spot which he had himself designated in 1848 as the probable site of the Mausoleum. By the beginning of April he had cleared the entire rocky platform which formed the foundation of the building. It is almost a square, measuring 472 ft. in circumference, and formed by quarrying into the solid rock. On the W. side of the platform there was a flight of steps leading to the upper terrace. The entrance to the inner tomb was probably on this side, and was closed after the corpse had been carried in by a huge stone, which was then in its place. Behind this stone was found an alabaster vase bearing two inscriptions, one in Egyptian, the other in cuneiform characters, signifying " Xerxes the great king." In the rubbish which covered the foundation were imbedded parts of friezes and colossal statues, and four slabs, representing a battle of Amazons, in excellent preservation. Extending his excavations beyond the foundation bed, Mr. Newton unearthed a number of flat blocks of white marble, halves of two colossal horses, and portions of a chariot. The figures, more or less complete, of several lions, a leopard, a woman in beautiful drapery without head or arms, the head of a man which proved to be that of Mausolus, and some ornamented lions' heads and capitals of columns, were also found here, and parts of a chariot wheel on the other side. The relics collected from various quarters comprised a number of standing or sitting statues from 8 to 12 ft. high, many lions, parts of friezes, and a multitude of fragments, all which were removed to the British museum, where the statue of Mausolus has been reconstructed out of 63 pieces, and is nearly complete. A female figure, wanting the head, has also been restored, and is one of the finest specimens of art recovered from Halicarnassus. Like all the architectural and sculptural parts of the Mausoleum, it was painted. With the aid of the partial measurements afforded by Pliny,Mr. 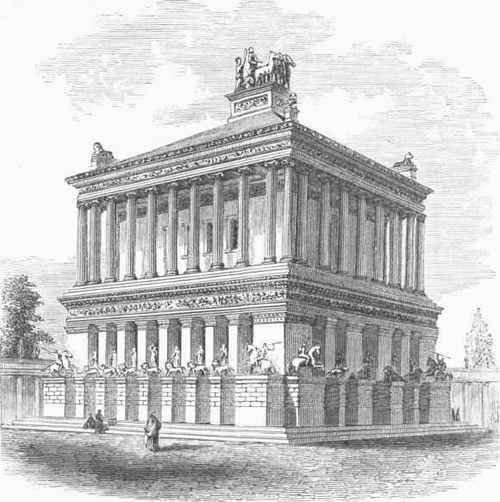 Newton, and subsequently Mr. Fergusson (see engraving), attempted to reconstruct the Mausoleum. The result is two designs widely differing from each other. Mr. Newton believes that it was a rectangular building surrounded by an Ionic portico of 36 columns, and surmounted by a pyramid rising in 24 steps, upon the summit of which was a colossal marble quadriga with a statue of Mausolus. - See Newton and Pullan's "History of Discoveries at Halicarnassus, Cnidus, and Branchidae" (2 vols., London, 1862); James Fergusson's "The Mausoleum of Halicarnassus, restored in conformity with the Remains recently discovered " (with plates, London, 1862); and Newton's " Travels and Discoveries in the Levant" (2 vols., 1865). The Mausoleum, as restored by Fergusson. Portions of the Friezes of the Mausoleum.